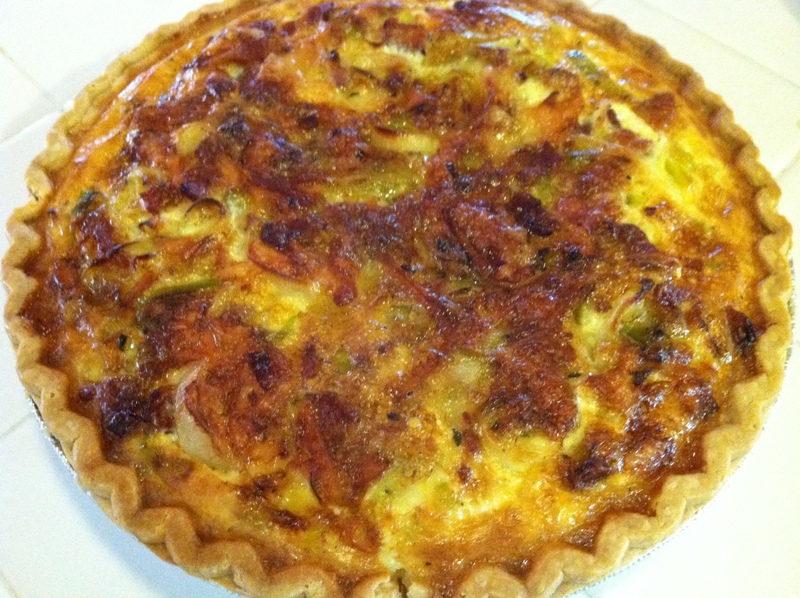 Gluten-Free Leek & Bacon Quiche: What’s In Your Box? CSA box, that is. I’ve been super into leeks recently. Don’t look at me that way, it’s totally normal. So when a couple of big, long, green and white beauties showed up in my CSA box this week I thought, hmmm, why not make a quiche? Naturally, my next thought was, why not add bacon? Sure enough there was a recipe online I found that did just that, although in tartlet form. So I mixed it up and pulled out my pre-made frozen gluten-free pie crust from Whole Foods, and went to town. Wow, was it leek-a-rific. Okay, the bacon was not bad either. If you want to substitute regular milk for the half-and-half, or go full cream, be my guest. It will be richer with the cream, but the bacon and leek deliciousness more than make up for the lack of milk fat. Do what you have to do, then enjoy this gluten-free quiche for breakfast, lunch, dinner, or second breakfast. No judgment. Well, except for my co-workers who have been screeching, “Who’s eating delicious breakfast?!?! ?” at my office every day when I eat this up first thing. Here’s how to inspire that kind of breakfast envy. Also, this is a crazy breakfast. Especially when you eat it every day for a week. Which I did. I said no judgment! 2. Thaw gluten-free pie crust for at least one hour. You can also pop it into a hot oven for 10 minutes to get that extra crisp feel. While crust is warming up, cook bacon in large skillet over medium-high heat until crispy. Drain, and keep 1 teaspoon bacon grease in skillet. 3. Cook leeks and thyme in same skillet with bacon grease. Add salt and pepper, and cook until leeks are slightly brown, 5-7 minutes. 4. Combine Gruyere, leek mixture, and bacon into medium bowl and combine. 5. Whisk eggs, egg yolks, and half-and-half together in medium bowl. Add a pinch of salt and pepper. 6. Spoon cheese, leek, and bacon mixture into gluten-free pie crust. Pour egg mixture over the top and bake for 40 minutes, or until center is firm. Tags: gluten free recipes, gluten-free breakfast, gluten-free pie. Bookmark the permalink.